We’re all mad here—the NCAA March Madness brackets have been released. Games will begin March 13, for the men’s basketball tournament and March 16, for the women’s. 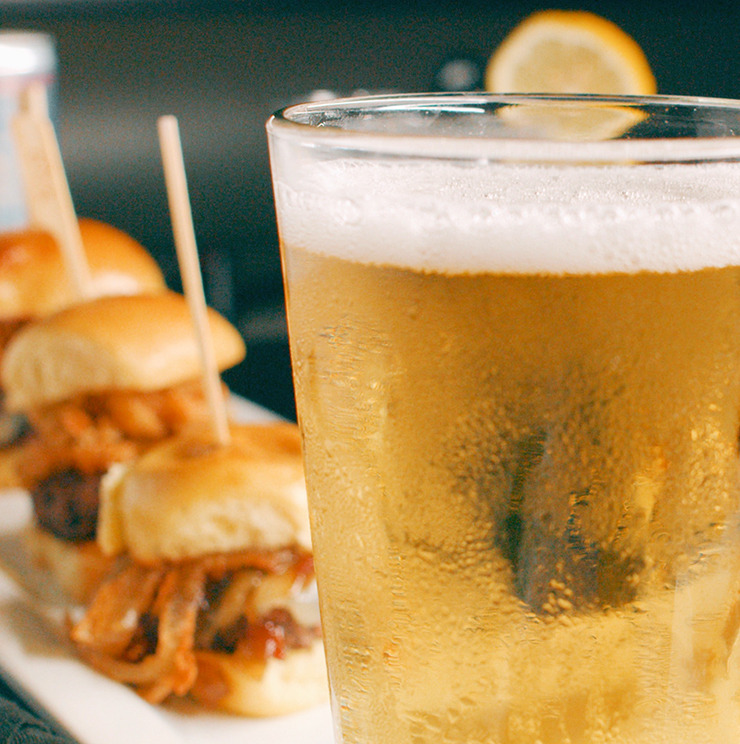 Between filling out your bracket and streaming the games throughout the day (don’t worry, we won’t tell your boss), it can be hard to decide where you and your friends should watch the games after work. If you need a few suggestions, we have come up with a list of some of the best deals Fort Lauderdale has to offer during March Madness. Bonus: a few restaurants on the list are holding contests with opportunities to win $1 million. Shoot your shot. 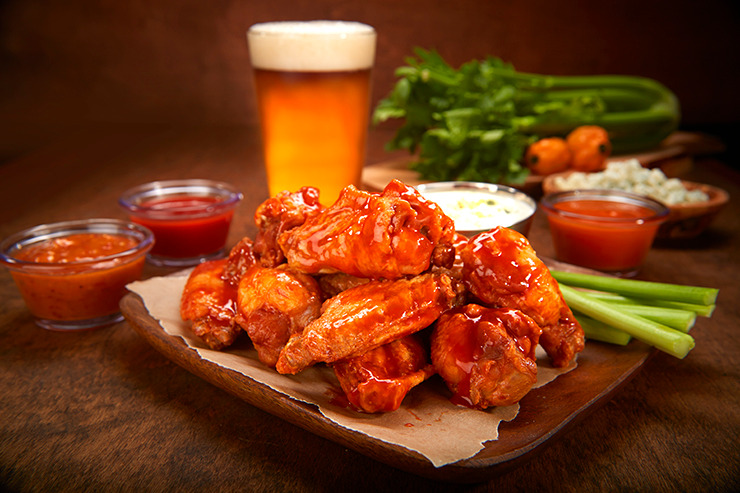 Cold beers and traditional sports bar fare—what more can you ask for to accompany the March Madness games? At Duffy’s Sports Grill, not only will you have great food, but there will be specials during games, including five-for-$10 Miller Lite and Coors Light buckets, five-for-$15 Corona and Corona Light buckets and two-for-one drinks. It doesn’t end there: Duffy’s will also be hosting the March Madness Bracket Challenge, where you will have a chance to win $1 million if you submit a perfect bracket. Points will be given out for every correct pick, so even if you don’t have a completely accurate bracket you can still earn points toward first, second and third place prizes that include a big screen TV, gift cards and $1,000. 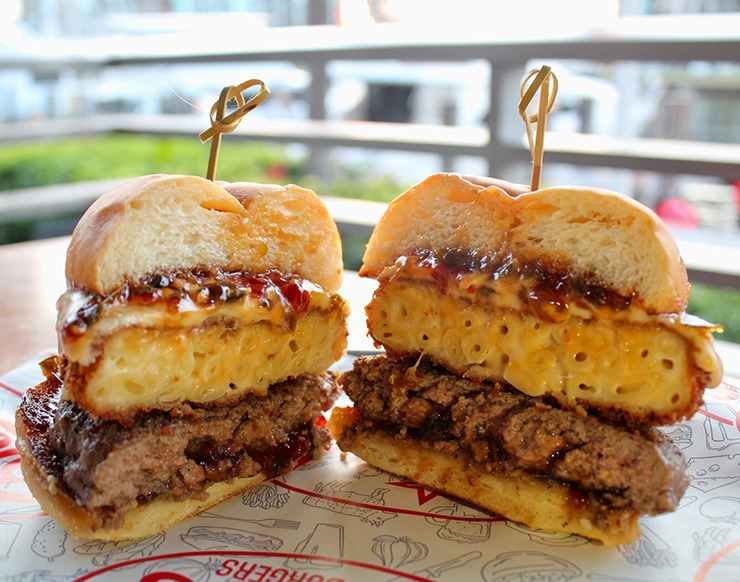 Located on the Diplomat Landing Marina, this laid-back burger joint is perfect for families and sports aficionados. With a free arcade and outdoor games available for both kids and adults, Bristol’s Burgers is a perfect spot to watch all your favorite teams compete. Special promotions include the option to build your own party platter with signature Hollywood fries, barbecue wings, sliders, tater tots and more. Drink specials include buckets of beer ranging from $25 to $30 and happy hour specials from 5 p.m. to 7 p.m. with deals like $5 beers, mac and cheese tots and more. 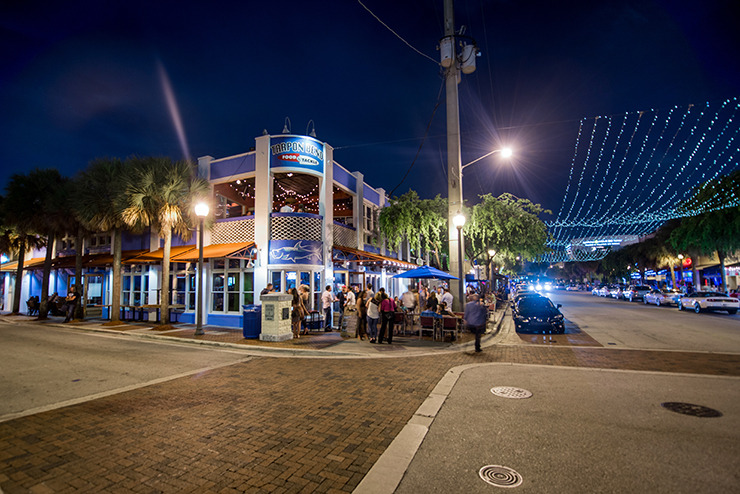 Founded in 2008 by former Miami Dolphins player Kim Bokamper, with multiple locations around South Florida, Bokamper’s has everything you are looking for in a sports bar. The restaurant will be offering specials including $1-off craft beers, draft beers for $3, Killer B Wings for 75 cents and $5-handcrafted burgers on select days, as well as the opportunity to win the $1 Million Bracket Challenge. Anyone with 60 or more correct picks will win $25,000. Other prizes include a 60-inch HDTV and Bokamper’s gift cards. Submit your picks by March 15. Tarpon Bend will be showing every March Madness game. Throughout the tournament enjoy deals like Bud Light and Shock Top pitchers for $12 each, 5-for-$12 Bud Light and Budweiser bottles and New Amsterdam Vodka drinks for $4. With a location in Fort Lauderdale and Miami, Tarpon Bend offers fresh seafood, a casual atmosphere and a seasonal raw bar. 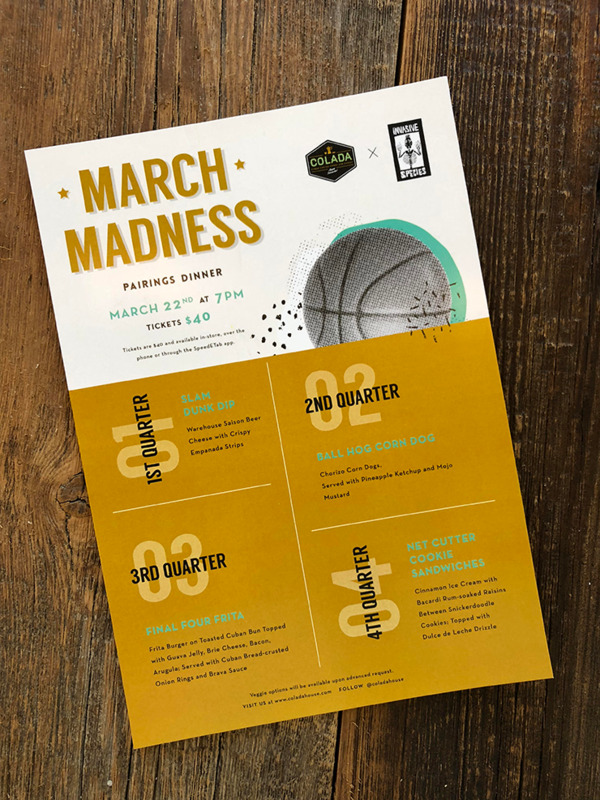 On March 22, head over to Colada House for a March Madness beer-pairing dinner ($40 per person) presented in partnership with the local Flagler Village brewery, Invasive Species. The beer dinner will pair Invasive Species beer with unique Cuban twists on your favorite stadium classics, like the Ball Hog Corn Dog, a chorizo corn dog served with pineapple ketchup and mojo mustard, and the Final Four Frita, a burger served on a toasted Cuban bun with guava jelly, brie cheese, bacon and arugula with a side of Cuban bread-crusted onion rings. Tickets to the event can be purchased in-house or over the phone.